While Belkin may have been first on-the-scene with third-party accessories that are compatible with Apple’s new Lightning connector, Scosche isn’t far behind with a lineup of their own. 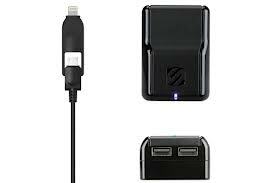 With 5W and 12W charging options for home as well as in your vehicle, Scosche has accommodated those who want the smaller form-factor, but hard-wired cable as well as those who prefer a detachable USB cable (giving you the ability to move it from place to place much easier without consideration for the power source). Prices for the accessories range from USD $24.99 for the car charger with a single hardwired Lightning cable to USD $49.99 for the low-profile 12W wall adapter with two USB ports and one detachable USB cable with convertible micro-USB and Lightning tips. Several other variations are also available. Unfortunately we have no specific launch date for any of these new products, though the company has said “some of them should ship prior to CES” in January (meaning just a little too late for holiday shopping this season).